On this page you'll find the archive of news items that we've posted on the Dragonlance Nexus all the way back into mid-1999. Sovereign Press has continued with their weekly previews of Legends of the Twins this week with a new spell and magic items. Be sure to check the weekly preview for more details. More fan material has been posted to the Fan Rules section! Henrad has updated his Platinum Mystic prestige class, Valharic brings us a beast from the novel Dalamar the Dark with the Shadow Hound, and Nighttree introduces the Chidren of the Pit. Check 'em out! Jamie Chambers of Sovereign Press has announced that Legends of the Twins is now available in PDF format from DriveThruRPG.com. According to Jamie, the print edition should hit the Sovereign Press warehouse by the end of the month. For more information on this release and how it affects Sovereign Press, check out this thread. Another issue of the Palanthas Herald has been released. Read about mysterious bandits, a solar eclipse, an expedition to Icereach, and more! Just in time for Xmas gift cards, I have updated the product listings with Sovereign Press's new release schedule, and also added some of Wizards' upcoming novels. Notable items include: Saving Solace, due in January, the Empire of Blood paperback, and a new YR novel titled The Crystal Chalice. I'm particularly looking forward to the new Taladas novel, Trail of the Black Wyrm, in April, and Amber and Iron in February. On the Sovereign Press side, new books include a new map pouch, Knightly Orders of Ansalon, Races of Ansalon, and some classic DL modules. See the new and unreleased products page for a full list. The Dragonlance Carolers strike again, this time with more new tunes in our music section. Check out the latest additions, including two of my favorites - Gunthar Got Han-dled By A Kender and Nuthin But Gilthanas. Plus Sean "Kipper" Macdonald brings us a special treat with The Toede who "Borrowed" Yuletide. Thanks to all of our Dragonlance Carolers for spreading the holiday cheer! We've got a couple of Christmas goodies that you might remember, including a prestige class by Kipper Snifferdoo and yours truly - Santa's Little Handler! Plus, a fun adventure - How the Grinch Stole Christmas. From all of us here at the Dragonlance Nexus, I want to wish you all a Cool Yule and a very Merry Christmas! Newsletter Posted - Issue #50! We have just posed issue #50 of our newsletter. Included is 2005 in review and some thoughts about the year ahead. Plus, some Nexus projects for the upcoming year. Check it out! According to ICv2, the release of Dragons of the Dwarven Depths will be supported with a New York City launch party to welcome back Weis and Hickman and with a multi-city author tour. Sovereign Press is releasing weekly previews of Legends of the Twins starting this week, and for the next three Mondays. Be sure to check out the first preview, the Knight of the Divine Hammer prestige class! Yuletide is upon us and another issue of the Palanthas Herald has been released. This issue features a disturbing report on the defenses of Palanthas, the Arrival of Lord Toede, a yuletide charity event, and more! A group of wandering kender calling themselves the Dragonlance Carolers have bombarded the Nexus with a plethora of new songs. Be sure to check out our music section for our recent additions, including such great Christmas tunes as Let it Burn, Tasslehoff the Light-Fingered Kender, Up on The Rooftop, and Deadly Night. Plus, the Chanukah DL Song! Of course, I think the kender had a bit too much of Flint's special eggnog with The 12 Days of Yule. Enjoy! This month's issue of Dragon magazine (#339) is the new annual campaign classics issue, including an article by our very own Cam Banks! Be sure to check out "The Ecology of Draconians." Subscribers should already have a copy, and issues should hit shelves shortly. Grab one for a friend for Christmas, or give yourself a little something. Congrats to Cam on his first Dragon article! Fans of the old Legends of the Lance newsletter might remember a series of articles called the Herald's Report. The tradition had continued on Steve Miller's site for a while. Steve has graciously allowed us to post the Herald's Report, which you can find in our articles section. The Herald's Reports are not only great reads, they also give a ton of ideas for games set in the pre-War of Souls era in the Age of Mortals. Plus, they've been an inspiration for our own Palanthas Herald. Thanks to Steve Miller for letting us post his Herald's Reports. GamingReport.com has given a very favorable review of Holy Orders of the Stars. The reviewer says he has "never been that impressed with Dragonlance's take on 'religion'. Until now." Find out more about it here. The Palanthas Herald Out Now! The latest issue of the Palanthas Herald is packed with exciting articles! Read a report from Mt Nevermind, find out more about the Flotsam Delegation, and more! Plus, has the Shadow Sorcerer returned? More fan material has been posted to the Fan Rules section! KenderBryant gives us The Orator prestige class, and Nael provides us with updated stats for Guerrand DiThon. Check 'em out! If you're looking to game during the time of the Cataclysm, we've got a great resource for you. We've posted an article by John Grubber called Using the Cataclysm, which details the era and the various effects of the Cataclysm. It also includes adventure hooks. Enjoy! We have just posted stats for Alleran Waylan, the father of Tika Waylan Majere! We've just posted an article by Talinthas detailing a new city of adventure. Presenting the City of Lantern! Sovereign Press has just posted some Dragonlance Wallpaper - "Paladine, Platinum Dragon", by artist Chris Dien. Check it out! White Plume Mountain Converted to 3rd Edition! Wizards of the Coast has updated another classic adventure to 3rd edition - White Plume Mountain! Also, be sure to check out the White Plume Mountain art gallery. Revisit the classic adventure or experience it for the first time! Dragonlance author Jeff Crook talks about writing for Dragonlance in his blog - How to Write a Dragonlance Novel. Thanks to Steffen Bogh for the heads up! We have a large round of fan entries this time! Our very own Trampas Whiteman gives us Dragonlance Unearthed, Nighttree introduces the Skinshifter, Kendermage provides us with stats for Kith-Kanan and Sithas, and finally, Henrad provides us with some Expanded Component Feats and the Platinum Mystic prestige class. Check 'em out! Latest Issue of the Palanthas Herald! The Palanthas Herald hot off the press! Read about the destruction of the Dark Queen's Shrine, an end to the water crisis, panic in Gwynned and more! I'm happy to announce that I just posted stats on one of Takhisis' aspects from the early Age of Mortals - the Shadow Sorcerer! This conversion makes use of the aspect template found in Holy Orders of the Stars. The other day we reported the unfortunate news that several of WotC's employees, including Peter Archer, were laid off. Margaret Weis has posted a thread concerning this bit of news on the boards, as well as an announcement - Peter Archer will be writing a Dragonlance novel! Find out more information on this thread. Here at the Dragonlance Nexus, we try to bring you the best of the old and the new. We've recently come across a transcript for a chat with Margaret Weis and Tracy Hickman from Feb. 22, 2000 - just before the release of Dragons of a Fallen Sun. Take a journey back through the River of Time and see what Margaret Weis and Tracy Hickman had to say just prior to the War of Souls. Enjoy! GamingReport.com has reported that there were several staff changes made at Wizards of the Coast. Among those affected was Peter Archer, Director of Book Publishing. Peter has been a good friend to the Dragonlance Nexus, and we wish him and everyone else affected all the best. We have two campaign journal updates. First is an update on my Age of Mortals campaign. There's new faces, and a wizard takes the Test of High Sorcery. Failure means death. Also, we have the stunning conclusion to the prequel play by e-mail game for my regular campaign - Cat's Tale! Learn the secret of a mysterious locket and follow along as Cat enters the Minotaur Wars! Enjoy! Check out our latest round of fan submissions! Tauren Kai-Jere continues The Journal of Nathril Stoneshaper, KenderBryant gives us the Sonic domain and the Focused Attack feat. Also, Nael has provided us with The Academy of Ergoth. Check 'em out! The Dragonlance Lexicon has a special new article - Jaymes Markham, written by none other than Doug Niles, the author of Lord of the Rose! Mr. Niles gives us a full history of Jaymes, including some insights into his past. Check it out! Dragonhelm's Guide to the Bards of Krynn has been expanded, now with a short write-up of the Song of Life, a tavern in Palanthas that doubles as a temple and academy for bards. Be sure to check out the article on the Song of Life in this week's Palanthas Herald. The Palanthas Herald has just released its latest issue which features the Song of Life, gully dwarf stew, more tavern reviews, and more! Check out our latest round of fan submissions! Kendermage provides us with Irda Racial Levels, and KenderBryant gives us a new core class with The Marksman. Check 'em out! The Palanthas Herald has just released its latest issue which features the first of a two-part series of reviews of the taverns of Palanthas, an exclusive interview with Emma Xela, the announcement of a new jousting tournament and more! Dark Chronicles: Dragons of the Dwarven Depths Cover Spotted! 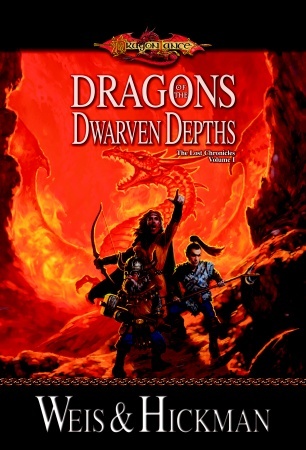 Looking for a preview of Dragons of the Dwarven Depths? Look no further! Board member Cossaw has spotted the cover of the first volume in the Dark Chronicles trilogy! Feel free to discuss the cover on this thread. White Plume Mountain to be Next Classic Conversion! We have recently learned that Wizards of the Coast will be converting another classic adventure - White Plume Mountain! You can learn more about the conversion on this EN World thread. Revisions and Editions - Good or Bad? There seems to be quite a number of number of revisions to old RPG products and new editions of some RPG products as well. Has it become too much? Read my editorial on the issue. New Issue of Palanthas Herald Hits the Streets! The Palanthas Herald has just released its latest issue. Read about a miracle in Purple Ridge, the Library's latest initiative, the possibility of a new arena and much more! I'm pleased to announce that two new RSS feeds have been added to the Nexus over the weekend. They include a new feed for Palanthas Herald articles, as well as a feed with the latest additions to the Dragonlance Lexicon project. Links to both feeds, as well as all of the other Nexus feeds, are available on the RSS page. Legend of Huma #6 Released!!! Devil's Due Publishing has released The Legend of Huma #6! Check out the comic book adaptation of the best-selling novel by Richard Knaak, adapted by yours truly! Enjoy! After being kicked out of Dargaard Keep in DL 16 World of Krynn, the Tarrasque has been partying elsewhere. Check out Elite Opponents: The Tarrasque, an article from WotC showing how this bad boy gets down! Check out our latest round of fan submissions! This week we have the Epic Mariner and Mariner Feats, a revised Tarmak Keena prestige class, the Traag Draconian, and an article on Suggested Skills. Check 'em out! Wizards of the Coast has posted a feat index, including some from the Dragonlance Campaign Setting. And be sure to check out our own Dragonlance Index for a complete listing of Dragonlance feats, prestige classes, and more! Wizards of the Coast has posted a tribute to Keith Parkinson, including testimonials from Matt Adelsperger, Tracy Hickman, Todd Lockwood, and R.A. Salvatore. Also, check out the Keith Parkinson gallery, including a couple of Dragonlance pieces that may look familiar. We'll miss you, Keith. Dragon magazine #339 will be the now-annual campaign classics issue. Included is a Dragonlance article: The Ecology of the Draconian. Fans are discussing the topic in this thread. Thanks to Sephzero for the heads up! Palanthas Herald Hot Off the Press! The Palanthas Herald has just released its latest issue, which features unruly kender, contaminated water supplies, discontent dwarves and more. Be sure to check it out! Poll: Who's your favorite Majere sibling? We're curious to know which of Caramon and Tika's kids is your favorite. Vote here! From the monthly character spotlight on the message boards comes the famed hero of the Chaos War. Presenting Steel Brightblade! Wizards of the Coast has re-released Tomb of Horrors, the classic module by Gary Gygax, and updated it to the D&D 3.5 rules. Also, be sure to check out the art gallery and the map. I added several new items to the site today. Notable are several new pieces of fan music by Nai, as well as a new bard on the run submission. I also added three pieces of new fan artwork, as well as a review of Sanctuary, the first book in the Elven Exiles trilogy. If you would like to see some of the other submissions that have been recently added to the site, make sure to check out the latest additions page, which lists everything new from the past month. For all of you Dragonlance fans who are also Browncoats, you might want to check out The Signal #15. Tracy talks about his part in the Serenity RPG, and a bit more. Shiny! The world of fantasy art has lost one of its greats on Wednesday when artist Keith Parkinson passed away. For more information, please click here. The Dragonlance Nexus staff would like to offer our condolences to Keith's family and friends on their loss. Est Sularus oth Mithas. Richard Knaak will be a guest of BLIZZARD, TOKYOPOP, & SIMON & SCHUSTER at Blizzcon, Blizzard's first convention! Location: Ananheim. Dates: this Friday and Saturday (October 28 - 29). If you're going to be there, check Tokyopop's and S&S's booth for signing times! Just a quick update on Dark Chronicles...The first book in the series is called Dragons of the Dwarven Depths, and will be available July 2006. Extra! Extra! Palanthas Herald Begins Circulation! The Palanthas Herald begins circulation today, bringing "news from Solamnia and the world". The Palanthas Herald brings you the latest news from the world of Krynn, in the spirit of the Waterdeep News and the Sharn Inquisitive. Be sure to check out our first issue! Devil's Due Publishing has posted the cover for Dragonlance Chronicles #5. Be sure to check out the alternate cover as well. Chronicles #3 should be at your local comic book store soon! Sovereign Press announce their partnership with DriveThruRPG.com. Key of Destiny, Towers of High Sorcery, and the Bestiary of Krynn are now available on the Dragonlance Product Page. Peter Archer of Wizards of the Coast made the following announcement regarding the remainder of the Dark Disciple trilogy: "Wizards of the Coast has decided that Amber and Iron and Amber and Blood, the next two books in Margaret Weis's Dark Disciple trilogy, will appear first in hardcover and subsequently in mass market paperback editions. Amber and Iron will release in February 2006, as originally announced. I hope all of you will enjoy the next installment in Margaret's exciting saga of Mina, Rhys, and the gods of Krynn." Wanting to know the latest Dragonlance news? Then be sure to check out the lastest issue of our newsletter. Enjoy! I'm please to announce that we have our first review of Sanctuary, the first volume in the Elven Exiles trilogy by Paul B. Thompson and Tonya C. Cook. Thanks to Heron for submitting his review. Also look for some new music and art in the next few days as well. Jamie Chambers was recently interviewed on the new game-focused program, RPG Radio - The Gamer's Podcast. Though most of the interview was focused on the Serenity Role Playing Game, there was a bit of discussion about Dragonlance. Tracy Hickman gives an interview with GamingReport.com, in which he discusses Dragonlance and much more. Click here to read it. Amber and Iron Cover Sighted! If you're looking for a preview of the upcoming second installation in the Dark Disciple trilogy, then check out the cover of Amber and Iron. You can also get some more details and pre-order the book here. We've added more fan submissions lately. Check out the Master of Wind and Wave prestige class, and take a look at character stats for Barreth Forlo and Dark Bishop Ondelos from the Taladas novel Blades of the Tiger. I added several upcoming products to the list today, on the D&D side of things. New additions include: Magic of Incarnum, Heroes of Horror, the Spell Compendium, and the Underdark Booster Pack of miniatures. Also check out new Dragonlance releases, including a re-release of the classic Tales novel, The Cataclysm, and the first volume in the Elven Exiles trilogy, Sanctuary. The full list of upcoming products can be found here. Have you ever wondered how the authors pronounce the gods' names? Then you should check out Pronunciation of the Gods' Names, which features how Jeff Grubb and Chris Pierson pronounce the names of the gods. For the official pronunciations, check out Holy Orders of the Stars. The Fan Rules section has been updated with some very interesting additions. Tauren Kai-Jere presents us with the dragon slayer prestige class, while Clive Squire has given us tainted-blood feats and the aboleth savant prestige class. Check them out! If you're looking to play a bard in Dragonlance, we've got an article for you! Presenting Dragonhelm's Guide to the Bards of Krynn, a massive article giving tons of options for playing bards, including materials from Unearthed Arcana. Check it out! If you're looking for a new monster to spice up your game, look no further! Presenting - the dragontouched. Enjoy! We have a new fan submission - stats for Guerrand diThon from the Defenders of Magic trilogy. As some of you no doubt noticed, early last week we added a feature to the Nexus home page that displayed the current weather conditions at Solace. Well, that was simply a prelude to a more ambitious effort to have weather data for a number of sites across Ansalon! Whether your gaming group is traveling to Solace, Solanthus, Palanthas, the desolate Icewall or the dark city of Neraka, we've got the weather for you. You can also get the full list of cities and the moon position forecast as well. I'm pleased to announce that after a significant amount of work researching Dragonlance novels for primary source material, and a good amount of work writing up a variety of articles, that the Dragonlance Lexicon project has finally gone online. The purpose of the Lexicon project is to serve as an online Dragonlance encyclopedia; to that end, we've started with a number of common subjects and will be expanding much further as the team is able to continue documenting more aspects of the Dragonlance world. Many thanks to project lead Kranar Drogin for putting in countless hours as lead researcher and author. That being said, have a look at the Lexicon! I've updated the Dragonlance Index to include materials from Holy Orders of the Stars and Spectre of Sorrows. Included is an updated listing of domains, magic items, prestige classes, and a new section on races (including the new Wild Gnome). Enjoy! For those that missed out on the Tales II series to begin with, Wizards of the Coast is re-releasing The Reign of Istar with a snazzy new cover, due out this month. With the supplemental books by Wizards of the Coast, there's a lot of new options for base classes in Dragonlance. If you're looking for some tips on how some of these classes might fit, check out Expanded Base Classes in Dragonlance. RPGNet has posted a review of Dragonlance Chronicles #1 (comic book adaptation). Prestige Class: The Dragon Mage! It began with Ulin Majere, but now the legacy continues on. Presenting the Dragon Mage prestige class! This makes a perfect counterpart for the Dragon Mystic. Enjoy! I've continued my series of variant progressions for Dragonlance classes. Check out the Knight of the Sword variant progression. Enjoy! We have just posted a review of Holy Orders of the Stars, courtesy of Ravenmantle. See why he gives it five out of five stars! This month, the Dragonlance Book Club is doing something a little different by talking about a Ravenloft novel. Knight of the Black Rose is the story of how Lord Soth went through the mists to find himself in Ravenloft. Author James Lowder is our special guest this month and is answering questions. So feel free to join in on the discussion of a story of Lord Soth that will simply chill your spine. From all of us here at the Dragonlance Nexus, I want to offer our well wishes to all those hit by Hurricane Katrina and to let you know that our thoughts and prayers are with you. If anyone wishes to help with the relief effort, please make a donation to the American Red Cross. May all those affected by the hurricane find their way back to the Inn of the Last Home. I added a new feature to the site today—a Dragonlance moon tracker and forecasting program. Using the rules from the Dragonlance Campaign Setting, the Nexus now features a forecast of the current position of Krynn's moons for the current day, as well as the forecast for the upcoming week. Enjoy! We have just posted a review of Key of Destiny, courtesy of Clarion. If you're looking for a new prestige class for your mystic, and one that is definitely Dragonlance, then you should check out the new Dragon Mystic. Enjoy! Poll: Should Amber and Iron be out in hardcover? There's been a lot of debate on whether or not Amber and Iron should be put out in hardcover format. What do you think? Vote here! For fans of the Legion of Steel, we present an alternation progression for the Legion of Steel prestige classes in Age of Mortals. The variant progressions make it easier for characters to achieve these PrC's, though the abilities are spread out longer over time. You can check out the article here. For those looking for stats for the new characters from Wizards' Conclave, we have a treat for you. First are the long-awaited stats for Coryn Brinewater, the 'White Witch' by Daedavias. Plus, not only stats, but an expanded history for the blind Black Robe dwarf himself - Willim the Black, courtesy of Joshua Stewart and B'naa. Enjoy! As a fan of Monte Cook's Arcana Evolved, I wanted to bring a bit of that magic to Dragonlance. I cobbled together the wizard base class, and the Wizard of High Sorcery and archmage prestige classes into an Arcana Evolved-style 25-level base class. Presenting the variant Wizard of High Sorcery progression. Enjoy! After quite a bit of revision, I'm pleased to announce that the common questions document posted on the Nexus has been expanded and renamed the Dragonlance FAQ. The document contains answers to a number of common Dragonlance questions on a variety of topics, from the history of the Dragonlance setting to novels and gaming products, to the various forums available for Dragonlance discussion. Comments and feedback are welcome. If you're looking for gaming stats for your favorite novel characters, you're in luck. The Dragonlance message boards has a new project - the Character Spotlight! Each month, board members will examine your favorite novel characters and endeavor to come up with stats for the Unsung Heroes of Krynn. So jump in on the discussion thread and vote for your favorite character! Board member Dalamar the Dark has learned from Devil's Due Publishing that the release date of the final installment of the Legend of Huma comic adaptation will be this November. Be sure to follow the discussion on this thread. I've just posted a review of Empire of Blood, the stunning conclusion to Richard Knaak's Minotaur Wars trilogy. Be warned that there are SPOILERS in the review. I've added a number of new pieces of artwork to the site this evening, including a particularly cool portrait of Kitiara. In addition, I added a new piece of music to the site as well. As always, these and the latest rules additions are linked on the latest additions page! Because you demanded it! Well, maybe not, but here's a fun little Bard on the Run for you anyway - Wings of Fire (with apologies to the late Johnny Cash). See why we call this one 'The Phaethon Song'. Jamie and Renae Chambers Spotted at LGGC! For those that missed the Lake Geneva Gaming Convention, you missed out! Margaret Weis, Sovereign Press, and other industry legends were there. We found a couple of pics from the convention - one with Jamie Chambers playing Arkham Horror (Jamie is on the right), and another with Jamie and Renae Chambers playing Robo Rally (Jamie is second from left, Renae is third). For more pics from the convention, click here. We've just posted our latest issue of the Dragonlance Nexus News! Find out the latest on Dark Chronicles, as well as other novel, gaming, comic book, and Nexus news tidbits. From the Hickman Newsletter: 'Tracy Hickman Presents - a series of Dragonlance novels written from all-new plots and characters created by me is currently in development." Speculation on what this new project is being discussed on this thread. Dark Chronicles Update From Margaret! Margaret Weis has given us a peak into the contents of Dark Chronicles. "Here's the subjects of the three books: The first book will recount the never-told story of the heroes and the Hammer of Kharas. The second book will look at Winter Night from Kitiara's and Lord Soth's viewpoint. The third book will be the story of Raistlin taking the black robes and working for the Dark Queen in Neraka." If you want to discuss this topic further, be sure to check out the Dark Chronicles thread on the boards. If you're going to be at GenCon, be sure to look up Tracy and Laura Hickman, the creators of Dragonlance! Be sure to check out their GenCon schedule. Take my advice and stop by for Killer Breakfast. It's a blast. If you're having some difficulties with multiclassing combos in Dragonlance, we've got a tool that will surely be of help. Presenting Multiclassing in Dragonlance, an article that not only gives the official guidelines, it also provides a chart to read them by and some unofficial options as well. Enjoy! I've posted a new entry in my Age of Mortals campaign. Be sure to check out The Shattered Temple - Part II. I've added a number of old products to the web site this evening. New (old) products include the Ral Partha Miniatures, the Graphic Novels series, and a Board Games category that includes the Dragonlance Board Game and the Dragonwand of Krynn. Lastly, I added Gnomes - 100, Dragons - 0 as well. Dragonlance Nexus Creature Competition Winner Announced! We have had a ton of great entries for the Dragonlance Creature Competition, but one entry stood out above the rest - the Naitik (Blight Apostle). Congratulations to Ravenmantle on a job well done! To see the other entries and to discuss them, check out the discussion thread on the forums. Though it is generally accepted that psionics do not exist in the world of Krynn, there are those who would like to pursue the option anyway. For those that would like to use psionics in their Dragonlance games, we present this article - Psionics in Dragonlance, filled with various tips and advice for psionics fans. Enjoy! Wanting to play a specialized cleric of Reorx? Look no further. We have posted a submission by Henrad, the Hammer of Reorx. Enjoy! For those looking to incorporate an Action Point system in their game, we present to you a variant Action Point system for Dragonlance - Dragon Points! Add an element of heroic luck to your campaign! From the guys over at the Tobril Magazine: "We'd like to thank the Nexus for hosting this issue while we sort some of problems with our web server. Also, the Tobril will be quarterly from now on. The new issue contains an illustrated article on Dragon Tactics, the new product schedule, and an article on how to use other books in a Dragonlance campaign. Other articles include a private scroll, the details of the ruins Samekh, and the Tobril's monster competition winner: The Gray Traveller." The 1.16 MB PDF file is available for download. Dark Disciple Volume Three Title! Board member Eldor Starblade has picked up the paperback version of Amber and Ashes and has discovered the title of the third and final book in the Dark Disciple trilogy - Amber and Blood! You can discuss the title on this thread. Fan contributor Clive Squire has submitted several new entries to our fan gaming section, including several new spells and an article on weapon and armor qualities. Be sure to check them out! For those following the Cat's Tale diceless adventure, the next chapter has begun. See what happens to Cat when she joins the crew a ship - Sargas' Fire! Spectre of Sorrows Release Date! Sovereign Press has announced that Spectre of Sorrows will be in print on July 22! According to Jamie Chambers, the product grew from 128 pages to 192. Please join the Nexus in supporting Spectre of Sorrows, written by Whitestone Council member Cam Banks! Since it doesn't happen very often, I'm pleased to announce three new pieces of music added to the site today. New composer Nai submitted three pieces, titled 'Battles and Burnings,' 'The Death of Flint,' and 'A Young Knight.' You can listen to all three as well as the many other pieces of music in the fan music section of the site. We've posted a new campaign journal - Cat's Tale, a diceless play by e-mail game depicting the story of a young female swashbuckler prior to the War of Souls. This is a prequel to my current Age of Mortals campaign. Learn how Cat becomes part of a minotaur crew and how she comes to have a tattoo of a dragon upon her shoulder. Spectre of Sorrows at Origins! From Jamie Chambers of Sovereign Press..."Spectre of Sorrows premieres at Origins, and copies will go on-sale everywhere within a few weeks." Think you have the biggest, baddest monster in town? Now you have the opportunity to see. The Dragonlance Nexus is conducting the Dragonlance Nexus Creature Competition for members of the message boards. If you're not a member already, be sure to sign up and join in on the fun. Winner gets a custom user title on the boards. For rules and other information, be sure to check out the contests page. Good luck, everyone! If you want to play a different sort of minotaur, or if you've always wanted to try out the two-bladed sword in your game, then you may very well be interested in the Twin Horns fighting style. Enjoy! Discover what is perhaps the elves' greatest secret... the little-known house of assassins. Presenting The Death Dealers! From the pages of Doug Niles' Lord of the Rose comes the sword Giantsmiter! Now you can use the fabled sword of Lorimar in your Dragonlance RPG. Enjoy! Margaret Weis announced on the boards that Richard Knaak's latest novel, Empire of Blood, came within a "minotaur's whisker" of making the New York Times' best seller list. Please join us here at the Nexus in congratulating Richard on this thread. I added several new pieces of fan art to the site today. Notable additions include a piece called White Dragon by Ksar, as well as a portrait of Alhana Starbreeze and a drawing of a minotaur Duel. I also added a couple of other submissions by Dragonfreak. You can find all of them on the latest additions page. The errata for the Bestiary of Krynn is now up and online. To download the PDF file, click here. I added several new products, and a review to the site today. First, I have written a review of Chris Pierson's Blades of the Tiger. If you haven't read the book yet, put it on your list! And now, to other new products. New to the site are re-issues of three anthologies from the Tales series: The Reign of Istar, The Cataclysm, and The War of the Lance. In addition, the first book in the Elven Exiles trilogy, Sanctuary has been added, as well as an Elven Nations Gift Set. Also notable is a new young readers series, Trinistyr, and the first novel titled Wizard's Curse. d20 Magazine Rack has posted a review of Chris Pierson's first book in the Taladas Chronicles, Blades of the Tiger. Also, be sure to look at how to donate to d20 Magazine Rack. It's a great site and they're looking for a little help to keep the site running. The Return of Fun Fan Feats! Our article on Fun Fan Feats has been revised with additions from Dragonlance board member Brinebeast! Enjoy! Looking to mix up your Dragonlance campaign by using one of the new races in Eberron? Or perhaps you're on wanderlust and want to give another setting a try. Either way, check out my Races of Eberron review and see why I think this is the best of the races books that Wizards of the Coast has released recently! I added two new reviews from Spyros Theodorakis to the site today. You can find his (and several other reviewers' opinions) on Wizards' Conclave, and a very complimentary review of A Hero's Justice as well. Dragonlance Chronicles Comic - Covers Sighted! For those of you who are looking forward to the Dragonlance Chronicles comic book adaptation, we've caught sight of both versions of the cover. The Companions cover features Tanis, Flint, Goldmoon, and a very excellent looking Raistlin. Plus, check out the variant Verminaard cover. That one blows me away! Be sure to ask your local comic stores about the comic as well as the Legend of Huma trade paperback. Holy Orders of the Stars Web Preview! Sovereign Press has released an early preview of Holy Orders of the Stars. Be sure to check out the Plague Knight of Morgion. You can discuss the Plague Knight on this thread. Tracy Hickman gives his thoughts on the background of Dark Chronicles. Check out The Rest of the Story, reprinted from the Hickman Newsletter #106. Scattered throughout the inns and taverns of Ansalon, the Barmaid is perhaps the most common type of adventurer in the campaign world. Now you too can bring this role to life in your campaign. Paladin and I had a little fun and worked up the Barmaid prestige class. Enjoy! We have just posted a review of Lord of the Rose. Check it out! Margaret Weis has had a couple of interviews lately. The first is at Sequential Tart and the second is at GamingReport.com. Enjoy! Brinebeast continues to provide us with his insights on adapting Dragon magazine to the world of Krynn. Check out his tips for issue #331. Kranar Drogin has been busy putting together an article on the Empire of Ergoth, including provinces and cities. The article includes a black-and-white map of pre-Cataclysm Ergoth, courtesy of Sean Macdonald, the cartographer for Tasslehoff's Map Pouch: The Age of Mortals! Tired of looking between prestige class requirements for the Sword and Rose Knights? What about the Legion of Steel prestige classes from Age of Mortals? If you're looking for a single guide, you might want to check out a couple of new articles: Combined Sword and Rose Knight Requirements and Combined Legion of Steel Requirements. We have just posted a review of Sandstorm. I've posted several new items to the site this evening. First, we have a great review of Tasslehoff's Map Pouch from Sovereign Press, which is an indispensable companion for any Dragonlance fan. In addition, I added several new pieces of fan art, including a great drawing of Kitiara and one of Verminaard from Irina Vargas. Check out the other latest additions as well! Kranar Drogin has worked up a new reference article on the Empire of Ergoth. Check it out! I thought I would post my thoughts on hitting the 3 million mark. Check out this article for a look back in time, including Tracy Hickman's original Nexus design! Richard Knaak has just released the latest issue of his PDF newsletter. You can download it here. Included is news on the Minotaur Wars Trilogy. Join us this weekend for a fan Q&A with Dragonlance author and game designer Doug Niles! For more details, check out this thread. Wizards of the Coast has posted an author profile for Chris Pierson, author of Blades of the Tiger and the Kingpriest Trilogy. Among the notable information is the title to the next Taladas Chronicles novel - Path of the Black Wyrm! Reference editor Kranar Drogin has been working hard to add some new content to the Reference section. New articles over the course of the past week include the Kingdom of Icereach, Midrath, the Kingdom of Falthana, Gather, Ismin, and Taol. d20 Magazine Rack has posted a review of Tasslehoff's Map Pouch: The Age of Mortals. The reviewer refers to Sean Macdonald as "very talented." All of us here at the Nexus would like to offer our congratulations to Sean Macdonald on a job very well done. We're proud of you, my man! From Jamie Chambers..."Dragonlance.com's products page has been updated, including all Dragonlance releases through the end of 2005! Included are the Dragonlance Starter Pack, Legends of the Twins sourcebook, Price of Courage (the conclusion of the Age of Mortals adventure trilogy), and finally Dragons of Autumn—a return to the classic Dragonlance adventures originally published in the 1980s! Tell us what you think of the new products on our Forums!" The hit counter has just clicked over the latest milestone in the Nexus' storied history: 3 million visitors. Yes, that's right, 3 million people have seen this news page in one form or another. I recall starting this site as 'The World of Krynn' many years ago, and moving it to Dragonlance.com, while I started working on another, smaller, project called the Dragonlance Nexus in 2001. Happily, both of those two efforts merged last June, and we now have the Nexus you know today. Throughout all of that, the counter has been keeping track of the various milestones, and I'm thrilled that it's finally broken this one. Many thanks go out to all of the people who have helped in the past, and the volunteer staff currently working on the site—and to all the fans who have submitted and continue to submit material to the site. Special thanks to Dragonhelm for his vision and work to make the Nexus a reality, and to Tracy Hickman for planting the seeds of that vision. Here's to 4 million! Wizards of the Coast has posted a character profile for Faros es-Kalin, one of the heroes of the Minotaur Wars trilogy. If you're looking for an adventure for your gaming group, then look no further! Sean Macdonald presents his unofficial adventure - Mystery of the Moon Steps. Enjoy! I try to spread a little destruction and mayhem, and what do I get? Kender! So for those of you who like that sort of thing, we've got the Paladin of the Chicken Feather, the Holy Order of the Spoon, and the Fizban Domain. Now if you'll excuse me, I've got to dispatch Dragonhelm like the weakling goody-two-shoes he is. I updated the wallpaper section of the site with three new wallpapers: Dark Mage by Icegal, Dalamar by Chelsea Conlin, and a large rendering of Dragonstrike by Leonid Kozienko. If you haven't seen the other six wallpapers that are already in the wallpaper section of the site, this would be a great time to download them as well. Enjoy! Brinebeast has returned this month with another article in his From Dragon to Dragonlance series. This month, he gives some tips for issue #330. Devil's Due Publishing has announced that they will be releasing a trade paperback for the Legend of Huma comic book series in trade paperback format, including a previously unseen issue - #6! You can discuss the trade paperback on this thread. The Legend Continues! I added ten new pieces of fan art to the gallery today, including a new rendering of Goldmoon by artist Irina Vargas. Simon Collins has updated his original Chaos Reaver adventure to the 3.5 Dungeons and Dragons rules. Be sure to check out Chaos Reaver 3.5! You know about the gods of Krynn, but do you know of the demigods? Nael has submitted stats for Jiathuli, Demigoddess of Deceit. For more information on Jiathuli, check out the AD&D module Wild Elves. I just finished Temple of the Dragonslayer, and I thought I would share my review of this book (scroll down to the third review). Be sure to pick up a copy for young readers in your household, but only after you read it first! Kranar Drogin has written several articles on various leaders throughout Krynn's history in our expanded Heroes, Villains, and Historical Figures section in Reference. Also, yours truly has written an article on the Black Guard from The Legend of Huma, including some notes I wrote in relation to the comic. Enjoy! GamingReport.com has posted some announcements from the GAMA trade show, including some Dragonlance news, and news on the Serenity RPG and the Dancing Dragons card game. Tobin Melroy has passed along some entries for his campaign journal. And what a title! You have to see it to believe it folks - WagonLance: Carriage of Heroes. Huzzah! We have several updates in our Reference section. Kranar Drogin has given us articles on the land of Khur, as well as the draconian nation of Teyr. Plus we updated the new Organizations section. There's a new article on the Knights of Solamnia, and we have updated our Wizards of High Sorcery article. Both articles include the level titles of Dragonlance Adventures. I'm pleased to announce the unveiling of a recent revision to the complete product list here on the Nexus. While the story-level list we have had for quite a long time was adequate, the other staff members and I went through and created what we believe are more logical groups for the various products, largely based on the time period in which the story occurs. Have a look at the revised list, and let us know what you think of it by discussing it in the forums. Karen Wynn Fonstad passed away Friday, March 11, 2005, from complications from breast cancer. Dragonlance fans will remember her cartography from such products as Dragonlance Adventures and Tales of the Lance, although she is perhaps best remembered for The Atlas of the Dragonlance World. Karen is also known for other atlases, including ones for the Forgotten Realms, Pern, and Middle-Earth. For more information, please see this article. Our thoughts and prayers go out to Karen's family and loved ones. Hey, gang, be sure to vote in the Pen & Paper Fan Awards. Please show your support for the current line of Dragonlance gaming products and Sovereign Press. Also, be sure to vote for Tracy Hickman for the Lifetime Contribution Award. Vote today! We've just put out issue #45 of our monthly newsletter. Be sure to check out the latest happenings in Dragonlance, including news on the Map Pouch, Lord of the Rose, and the best of the Dragonlance Nexus. Enjoy! Long before The Legend of Huma was adapted to the comic book format, there were Dragonlance comics available. If you were a Dragonlance fan back in the mid-1980s, you may remember the 34 issues DC Comics put out telling the story of Dragonlance. If you weren't a fan back then, then you can check out the covers of those comic books with our newest feature on the Nexus: the DC Comics / Dragonlance page. Enjoy! Richard Knaak has released his first newszine (PDF download). The newszine details the latest news for Diablo, the Dragonrealms, Warcraft, Dragonlance, and more. Sean Macdonald Discusses Map Pouch Contents! Sean Macdonald gives us a look into the contents (in typical kender fashion, of course) of Tasslehoff's Map Pouch. Discuss the contents on this thread. Sovereign Press has posted a preview of Tasslehoff's Map Pouch: The Age of Mortals. The map pouch is done by none other than our own Chief Acquisitions Officer, Sean Macdonald, aka Kipper Snifferdoo from Kencyclopedia.com! Congratulations to Sean on a job well done! Wizards of the Coast has posted a character profile for Sir Jaymes Markham, the hero of Doug Niles' new novel, Lord of the Rose. Enjoy! Wizards of the Coast has posted some goodies for Doug Niles' new novel, Lord of the Rose. There's a sample chapter, Lord of the Rose wallpaper, and an interview with Doug Niles. This book is a great read and one I highly recommend. We've posted a review of Races of the Wild. Fans of the Heroes of the Heart may like to see some character stats for Blister Nimblefingers and Dhamon Grimwulf, courtesy of Tobin Melroy. We have just posted Kipper Snifferdoo's Ancestor Stone campaign journal. This 22-entry campaign journal details the adventures of two elven sisters and their companions who discover an ancient amulet that is said to trap the souls of the dead after they recently die. How does Chemosh figure into this? Read up on the Ancestor Stone and find out! I'm pleased to announce the newest addition to the Nexus: the Dragonlance name generator! Thanks in large part to the efforts of reference editor Kranar Drogin, we were able to piece together a comprehensive list of Dragonlance names (more than 3,000 in all) into a utility that will randomly generate a character name for the race and class you choose. Look for some additional tools in the future as well. I added another few pieces of artwork to the fan art gallery today. The nine new additions include several pieces by a number of new artists. My favorite is Bupu, by new artist Travis Eck. Mary Herbert Fan Interview - This Weekend! Dragonlance.com is hosting a special interview with Mary Herbert this weekend that will be conducted by the fans! Be sure to check out this thread on the boards, and bring your questions! Dragonlance.com has just posted stats and backgrounds for the major characters of Weasel's Luck. Check it out by clicking here. If you're interested in Towers of High Sorcery, be sure to check out my review (as well as Tobin Melroy's). Both reviews give some great insight into the book. Here's a Valentine's Day gem for fans of Taladas! When digging through my archive of Dragonlance materials the other day, I found a copy of this piece, written by the Taladas master himself, James O'Rance. The Chronicle of Taladas is the history of the continent of Taladas, and it mirrors the Iconochronos of Astinus for the Ansalonian side of the ocean. Upcoming Mary Herbert Fan Interview! Mark your calendars for February 19-20. Dragonlance.com will be hosting a special interview with Mary Herbert that will be conducted by the fans! Be sure to check out the announcement on the boards, and bring your questions! Brinebeast has just submitted a new article - From Dragon to Dragonlance. This article shows how to adapt the contents of Dragon magazine #328 for use in the Dragonlance campaign. Thanks to Brinebeast for the submission! Dragonlance fan Talinthas has shared with us his editorial on the state of affairs for Dragonlance as of February 2005, including the response from Jamie Chambers (from the mailing list). Agree or disagree? Voice your opinion on this thread. I added another six or so pieces of fan artwork to the site today. Four new pieces of art were submitted by Icegal, including a cool rendition of Dalamar and an interesting take on the appearance of Her Dark Majesty. Also check out two other notable pieces by Sticko. As always, see the fan art home page for the most recent additions to the section. We have just posted a review of Dragons in the Archives: The Best of Weis & Hickman. The book is an excellent read, I might add. Check out my review for details. We have updated our draconian article in our reference section to include the noble draconians from the Bestiary of Krynn. If you're looking to see how other people are running Key of Destiny, you should check out our campaign journals section. Benathalis and I both have updates on our games. The Dragonlance Book Club will be discussing Night of Blood and Galen Beknighted. Be sure to join in on the discussion! We've just posted issue 44 of our newsletter, the Nexus News. You can check out the latest in the world of Dragonlance by clicking here. I'm pleased to announce that we've added a new feature to the Nexus: desktop wallpaper! We'll be featuring work from various artists from the fan art section here, and adding new wallpaper downloads on a fairly regular basis. Also, if you're browsing the fan art section and have any requests for new wallpaper, be sure to let us know. For those looking to recapture the feel of the Wizards of High Sorcery spells per day charts from Dragonlance Adventures, you may be interested in a new article we posted. Check out our Variant Wizard Spellcasting Charts. Enjoy! We've just posted a review of Complete Adventurer. Check it out! I've added five new pieces of fan artwork to the site today. Check out new artwork from CyanBlutgeissel, two pieces of artwork from Sticko, a piece from Aspen, and finally one from Dal the Dark. Chris Pierson, author of the Kingpriest Trilogy, has been kind enough to pass along a listing of the Kingpriests of Istar. Enjoy! New 2005 Dragonlance d20 Products! Dragonlance.com's Products page now has two new products listed for 2005, including Tasslehoff's Map Pouch: The Age of Mortals and Holy Orders of the Stars. There is also updated release information for Spectre of Sorrows. Those of you who enjoyed the compiled lists we've posted recently may also be interested in a compiled list by Wizards of the Coast - Rules Reference: Feats, Prestige Classes, and Spells. There's a PDF version as well, which makes this a handy reference for the DM and players. The recent tsunamis that hit southeast Asia have proven to be among the worst of natural disasters to ever hit man, with a death toll that exceeds over 150,000. All of us here at the Dragonlance Nexus wish to express our heartfelt condolences to the families and friends of all the victims. If you want to know more about how you can help with disaster relief, then please see this thread on the boards.